A CoinNews photo of this year’s five 2018-dated quarters. These are silver editions released in silver sets. 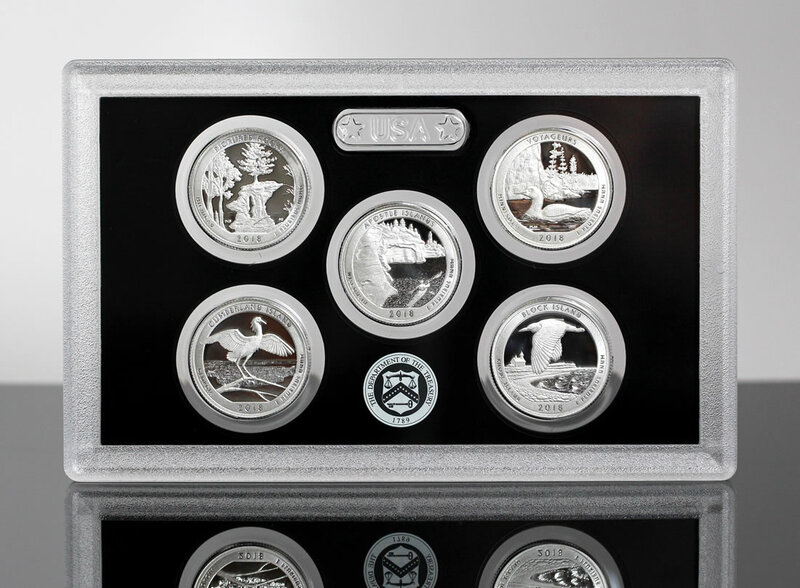 For now, and since mid-October, the U.S. Mint’s flagship annual sets and proof American Silver Eagles have amassed the most sales. The 2018 Proof Set, 2018 Silver Proof Set and 2018 Mint Set have led, followed by the ‘S’ and then the ‘W’ proof Silver Eagles. In its latest report, the U.S. Mint published sales data for 180 numismatic products. Eighty-eight of them outperformed their prior weekly gains against 69 previously. Five products increased by more than 1,000 units, matching the previous report. In addition, 3 products saw their sales reduced against 4 previously. Two of them declined modestly. The 2018 Quarters Circulating Set fell by 680 units to 14,599. Below are tables showing the latest sales for U.S. Mint numismatic products. The sales period covers from Nov. 5 to 11. Products with an asterisk (*) are no longer available or had no reported sales. Hurry up kid$ the 2016 AG Proof golds are going off sale 12-31-2018….get them now! Also the 13spot silver Eagles for $55…such a deal from YOUR usmint.. I had to post something this board is as quiet as a titmouse…..
Just noticed that the Mint posted their 2019 product schedule – what the heck is the United States Mint 2019 Rocketship??? My guess is the 2019, 50th anniversary of the Apollo 11 moon landing commemorative coins. Thanks – I was hoping it wasn’t a 20 oz Apollo 11 replica – like the silver bullion bullets I’ve seen on some sites.